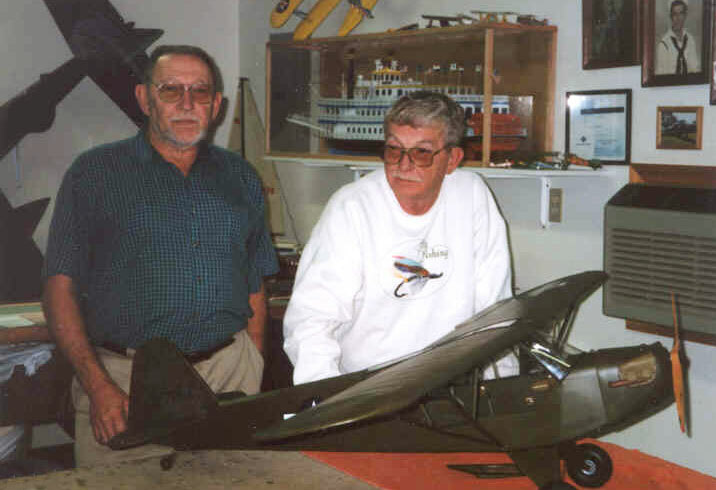 The museum has one of the best large scale model aircraft displays around and gallery visitors are understandably amazed at the quality and detail of the aircraft. 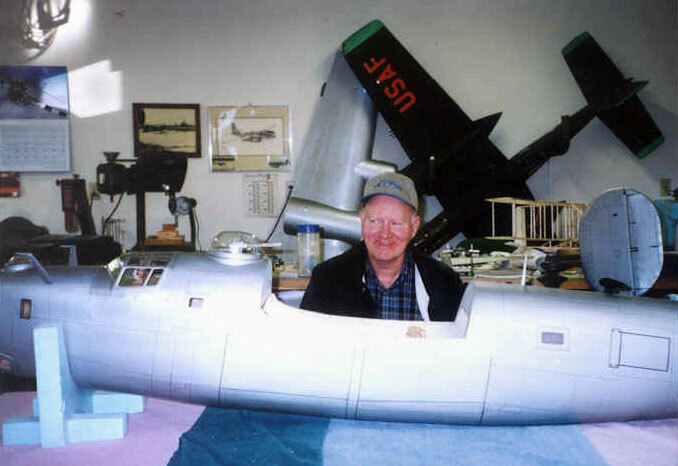 Below are photos of the construction of the B-24 Bomber scale aircraft, which is on display in the museum gallery. 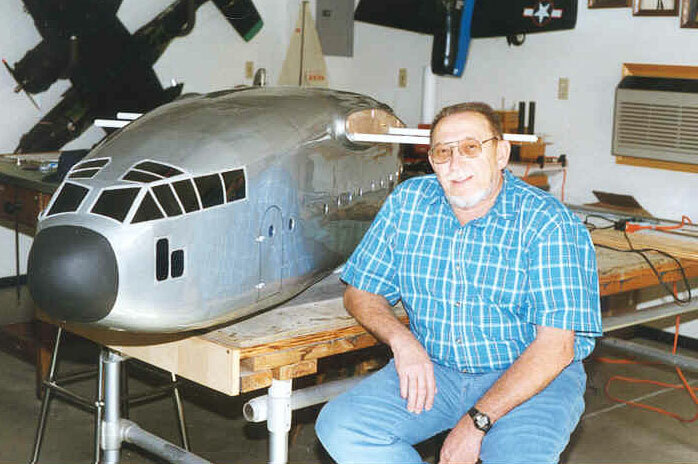 Glen Grube, Charles Abbott, and Joe Grube worked on the project. 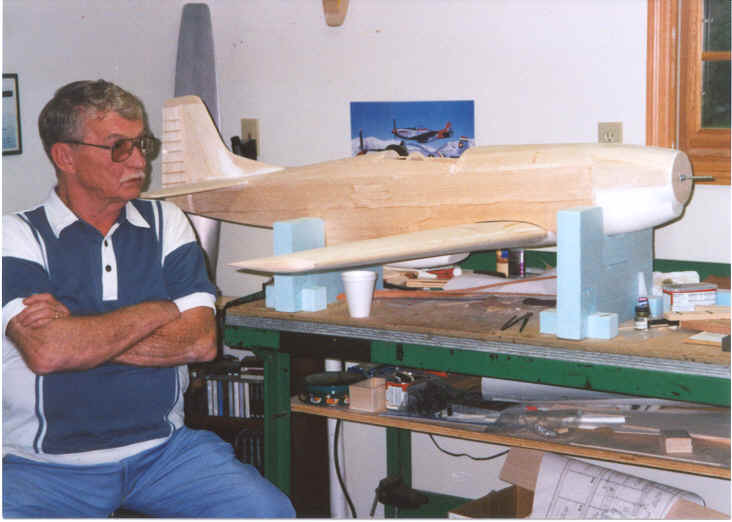 The Grube Brothers' "Possum Works" was always a gathering place for museum volunteers to watch as they worked their magic, transforming pieces of wood and bits of metal into one-of-a-kind scale classic aircraft. 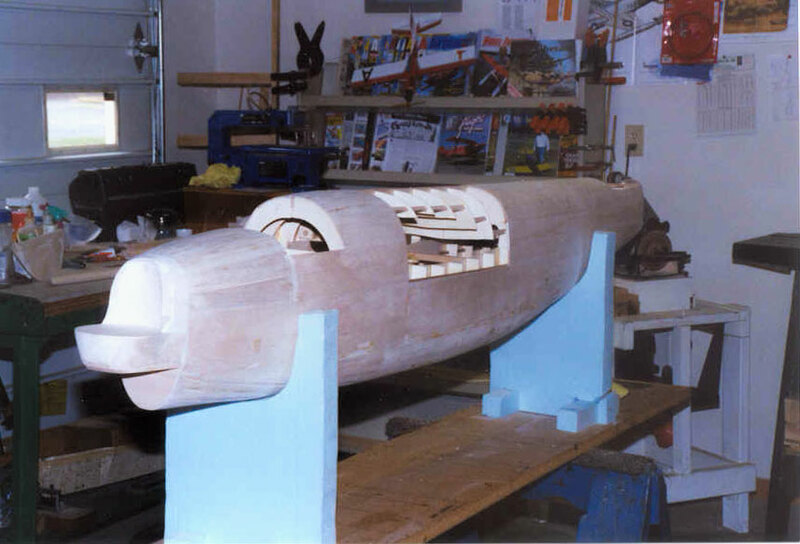 The skilled craftsmen designed and built these one-of-a-kind models at their shop in Columbus, Indiana called "The Possum Works," sort of a take off of the famous Clarence L. "Kelly" Johnson, Lockheed "Skunk Works." 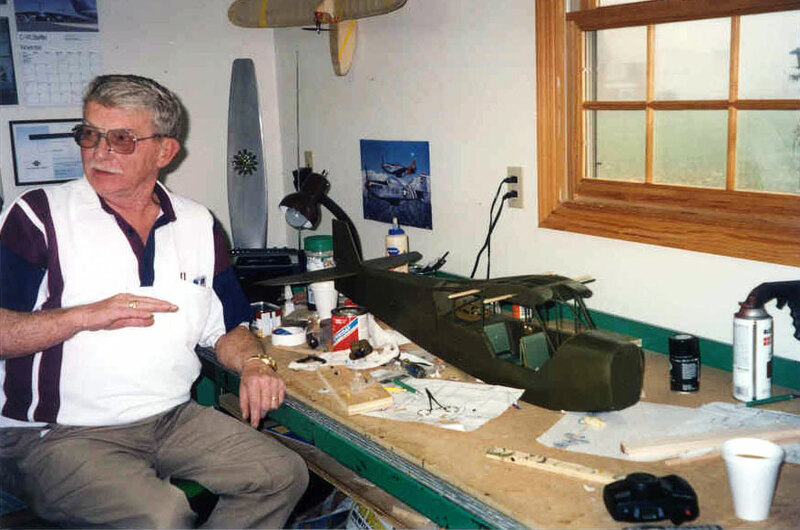 The scale model aircraft were masterfully painted by Charles Abbott, a Cummins retiree. 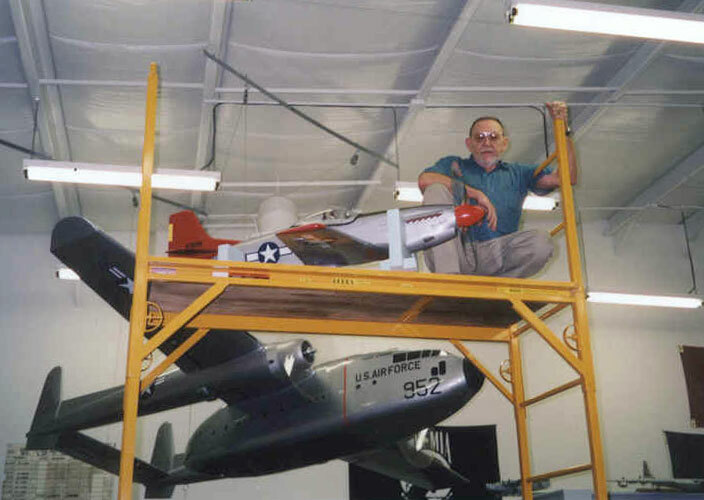 Joe Grube preparing to hang the P-51 1/8 scale aircraft. 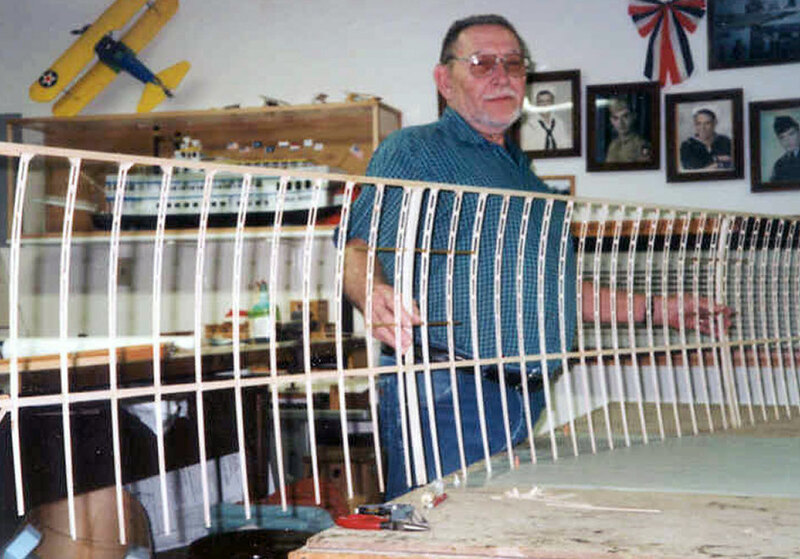 Glenn Grube working on the P-47 and P-51 projects at the Possum Works. 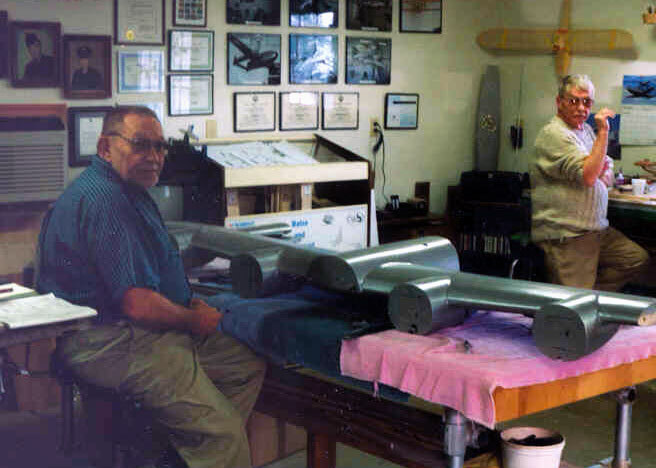 The Grube Brothers worked on scale model aircraft for display at the Atterbury-Bakalar Air Museum at their "Possum Works." 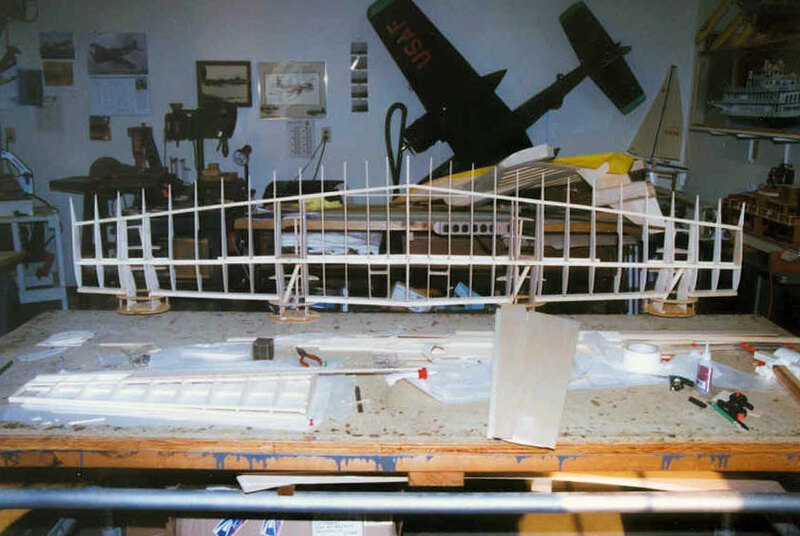 Bob Kirk, museum volunteer and former B-24 pilot, snapped these photos of the one-eighth scale B-24 construction project in progress at the "Possum Works." at the National Museum of the United States Air Force. 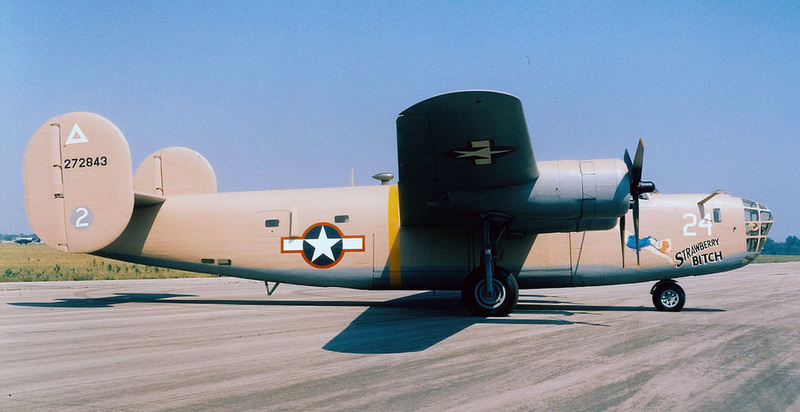 The B-24 was employed in operations in every combat theater during World War II. Because of its great range, it was particularly suited for such missions as the famous raid from North Africa against the oil industry at Ploesti, Rumania on August 1, 1943. This feature also made the airplane suitable for long over-water missions in the Pacific Theatre. More than 18,000 B-24 Liberators were produced. Engines: Four Pratt Whitney R-1830-65s of 1,200 hp. ea. 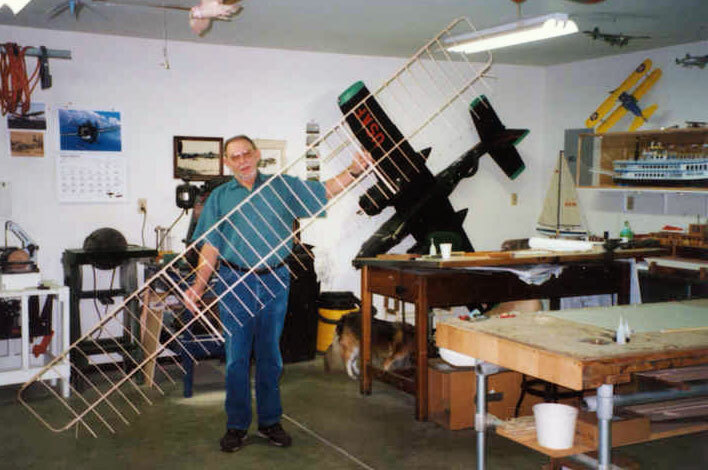 The 1/4 scale Wright Flyer #1 is displayed in the Atterbury- Bakalar Air Museum lobby. 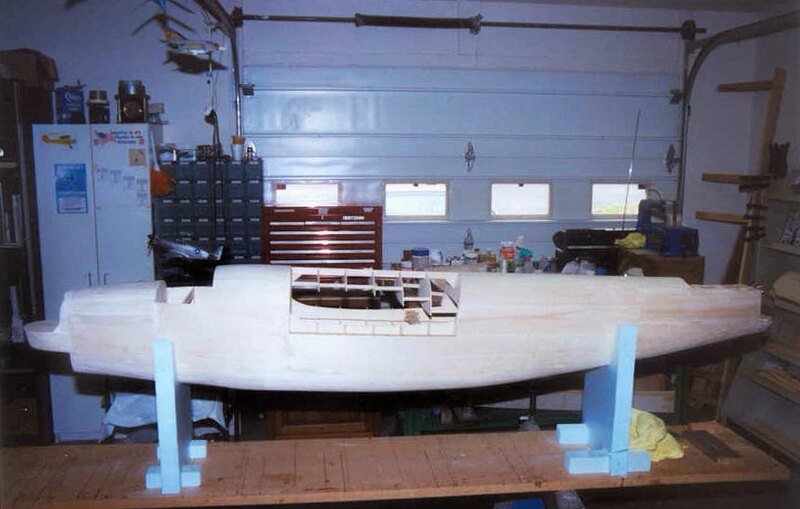 The Wright Flyer #1 was constructed from a copy of the Smithsonian's original plans. 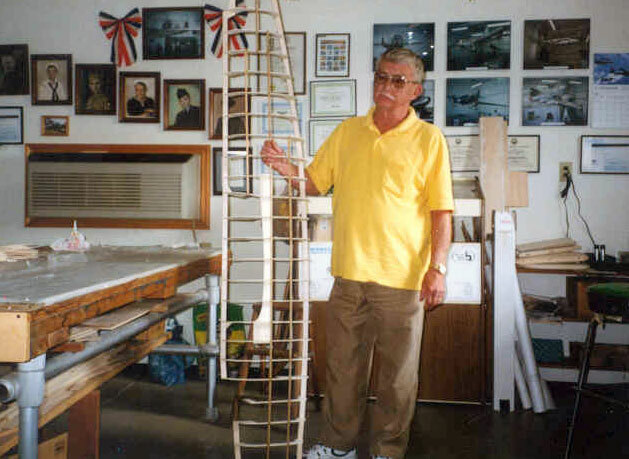 Joe Grube has the Wright Flyer wing sections in hand and you can see how large the 1/4 scale aircraft is. 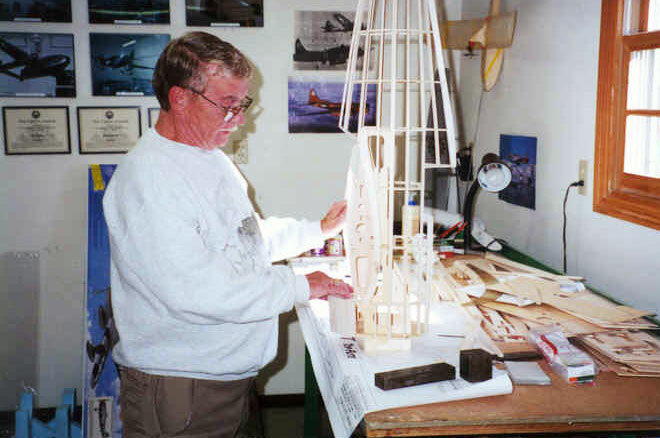 Glenn Grube working on the 1/8 scale L4 at the "Possum Works." 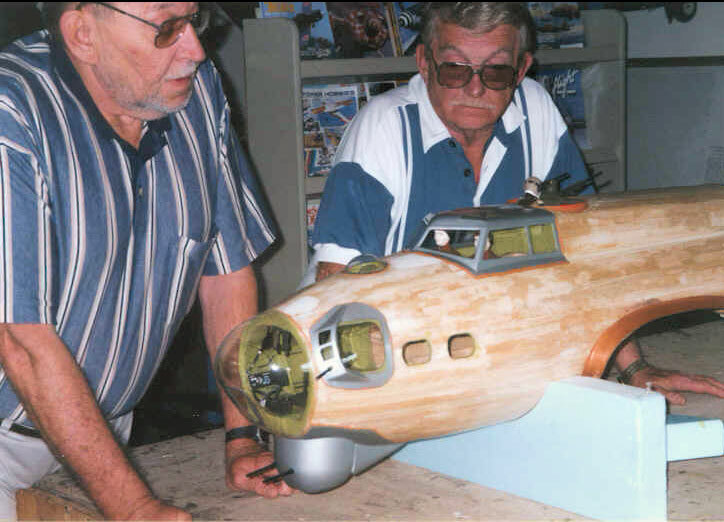 Joe and Glenn Grube putting the final touches on the L-4 at the "Possum Works." L-4 aircraft were used at the Atterbury Army Air Field as part of the Glider training.